To make pattern first make one inch graph paper, then draw the pattern to match the picture. 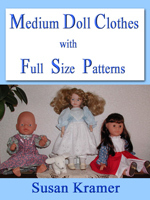 The PDF ebook has a full-size pattern. 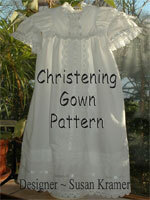 You may use this pattern for yourself but not commercially. 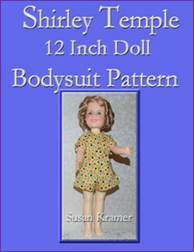 One quarter inch seam allowance is included in pattern. - Cut four pieces of pattern. 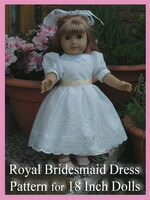 - Make the opening for the doll to step into in the front, from neckline down to below waist. - Sew center seams of front pieces with that opening. Sew entire back seam. Now you have a front and back piece. 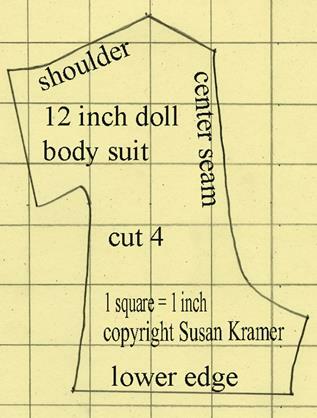 - Sew front and back shoulder seams together. - Sew back to front underarm seams. - Sew front to back crotch seam. 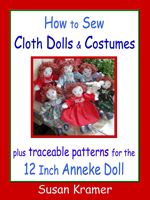 - Now sew all hems by rolling in one eighth inch twice and blind stitching by hand for a finished look. - Overlap front finished hem, and sew on sticky dot about one inch down from neckline.